We code our games and put in asserts to catch when things go wrong. We put the game to the test, then when it comes to release, we turn off asserts and go about optimising and submitting the game/app to the testers/users. So, when you train to ride a motorcycle, you should wear a helmet and jacket, special boots, because you don't know how to ride. But once you can ride, you might as well go around in flip flops and shorts. Why don't these two things match up? In console games, we've got to make the game work. Almost 100% or else. However, during our 99% of the time building it before final release day, we should leave asserts on even in the release code. I'd go so far as to say that as games can be patched on consoles now, it would be good to have a crash actually let the user submit a bug report. Just like windows apps keep on trying to do, but instead of actively doing it, maybe we should build it into the game so it silently reports bugs if it can. A bit like "document recovery" if you like. The pre-processor provides some keywords: __FILE__, __LINE__, and __COUNTER__. They provide you with some locality information, however, counter is only relative to itself. If you read my earlier post on the nastiness of the ## command in the pre-compiler, then you'll be able to guess what this is going to be used for. Okay, now you have a unique in that file, identifier system. Go team. If you write a basic code class, such as a stack, a list, a queue, you can get the code to be clean and readable and fast. You can optimise it and make it very small and fast and readable too. You can perfect the code. You have the capacity to actually make something that cannot be improved. This is because there is a finite number of ways to do it and the finite number is not too large for human time scales. Now, in your mind, imagine doing that for a full size development project. Can you see the towering complexity of doing it perfect in your mind yet? Okay, well, that's what's called clean room development. It takes moderately more time than normal development, about 100-200% more, but returns almost perfect complex systems. Almost perfect, because at some point a human will have made a mistake or an assumption. There is no escaping errors when the possible set of solutions is so large that to even count it would take a multitude of universe lifetimes. So, should we adopt the clean room development model? Can we adopt it? I don't think we can, or even should, because one of the main features of a clean room project is that the full project definition is known about from day 1. That's something we never have. Now, consider bridge building. Would you submit to clean room development on a bridge, where lives are at stake in case of the collapse of the bridge? Would you spend a little more time making sure that everything was perfect and there were gross over tolerances in all the materials used? Yes should be your answer. And do you think that real world mechanical structural engineers use clean room development model? They don't. They get a half finished proposal written on a napkin, told a random budget and time frame and get started. Just like us. The only benefit they have is that their product can't get exponentially more complex after the initial design. If the only difference between physical engineering and software engineering is the linear vs exponential complexity. That alone is enough to explain why clean room development is so successful in programming. It stems the complexity bleed we get in computer software. It stops the applications or games from getting out of hand. It makes the job more linear. So, now I ask again, should we use the clean room development model? I think we need something like it, if not it. We need something to stop the constant complexity increase. What can that be? Can we reign in our apps and games to be made of "materials" that don't grow in complexity? Can we do this with well engineered architecture model that allows modules to be used without adding any more than a linear increase in complexity? Behaviour oriented development might be a solution to this for games where much of the complexity of the game comes from relatively independent subsystems connecting where it's only just about necessary. Behaviour oriented development also allows for simpler upgrade path if the game is developed iteratively with napkin design changes. The problem we often face with games development is debug cycles and how long between getting into the game and back to the problem. There are two issues at stake here, one is the rate at being able to get back to where you are once the game code has recompiled, the other is how long it takes to recompile. I'm going to talk about the latter. Header file changes. They cost you a rebuild-most if it's a relatively important header. A rebuild all if it's a base file, and at least a rebuild few if it's a relatively unused one. If it is only going to cause one file to rebuild, then why is it a header?!? If you want faster compile times overall, use precompiled headers. Use them to reduce the number of times your compiler has to load up the whole windows.h tree of includes. Of course, even though this will make your rebuild alls take about 25% of the time they used to take, it will mean that any header change will cause a rebuild all. So, take off precompiled headers? no, i don't mean use libs liberally, that can be cumbersome, tedius to debug, generally a pain in the what-not. No, just think like a library. I library is an object file generated from multiple CPP files right? well, you can do that mid project if you like. okay, what does this give us? it gives us a cpp file that compiles quickly (because it's only including one set of headers), and it compiles to one object that can be linked like any other single CPP object in your project. so, at the expense of looking after namespace collisions between inlcluded CPPs, we have a vast reduction in recompilation speed approximately the same as using PCHs that will still only rebuild-most when we change a header file. WIN-WIN... except some people will think it's ugly and bad engineering. Oh well. I've got to list out a load of stock items, make an enum entry for each of the items, and then add information about each stock type to a set of global arrays. The chance of me forgetting one of the arrays, or getting a position in one of the arrays wrong, is so high that I have to use a system to ensure simpler updates and more secure ordering of the data. Along comes a technique I learnt a long time ago, someone called it the XMACRO system, well, I still call mine XMACRO, but it's just habit. have a look at these three files to see how it works. What we have is a macro being defined, then being used to generate lines of information by including a file that is made solely out of those macro calls. This technique lets you add and remove items very easily, as all you have to do is modify one file to add or remove or adjust a line of data. 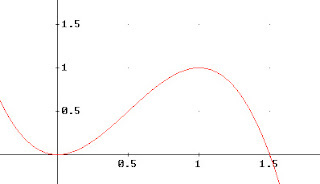 this is a simple formula for a smooth curve from 0-1 given an input from 0-1. The curve has first derivative of zero at both start and end. Can you recognise the need for this function? I wrote it because I wanted to scale a vector by a float, but didn't want to have the float trailing the vector. Simple really. What's even more simple is that this function doesn't need any special access privileges, and is inlined so it takes up zero time in the linker. If we wrote more functions like this, we'd have cleaner code and lower link times. There's always been a communication problem while working with games artists, but the situation can be remedied as long as you always remember one thing. you know how int's work, signed ints are not much harder to properly understand, but floats make some people whimper. if the sign bit is true, the number is negative. using this information, you can now see how easy it can be to double or halve a float (just +1 or -1 from the exponent), and you can see how making it negative is purely a 1 bit twiddle. After masking off the sign bit, floats can be compared for greater than and less than just like ints. Almost any bit pattern can represent a float. Apart from when the exponent is 128.
learn them and you can spot data going wrong in debuggers easier. # commands are great for breaking things in novel ways, so they should be avoided like gotos. That is, avoided when necessary, used sparingly, sensibly. They operate on text and text alone. They have no idea what a symbol is. if you #define a macro, the macro code is placed inline for every time you use the #define, which can lead to a lot of code generated from a very small amount of code. so, think about the pre-processor as being a text macro system for a completely different language and you'll be pretty close to what it really is.